Work for Datto Virtual SIRIS? "I describe my experience with datto"
That datto is software that offers solutions to different business problems. by means of its platform it guarantees you not only physical solutions but also virtual ones for different types of problems that you have. what I like the most is that it gives you backup copies of different types like those of your files like those in the database. also in case one of the copies you have lost or deleted by mistake offers you the recovery of them so giving you a greater confidence and tranquility when it comes to keep your files safe. what I do not like about datto is that it has a configuration that consists of making a continuous backup which is in charge of backing up continuously, it is something that although it protects to a certain extent there are certainly some files that you do not want to generate copy of security by Be simple and do them. That its storage capacity allowed to store greater capacity of files to backup. Datto serves for those companies that want computer security when backing up their files by means of backups providing them with all possible solutions for their virtual platforms. It also guarantees that your database server is protected by this software, on the other hand it gives you security in gigabytes to store important information. "Great backup solution, and very MSP friendly partner"
Backups, once setup, are a breeze. We are able to restore files and whole servers in no time flat. Exporting data from the virtual appliance to the production network is so smooth. We have used the physical SIRIS platform as well, and the virtual performs just as well. If you know one Datto backup solution, you can use them all. Also, not tapes, ever! We have one of the virtual SIRIS appliance deployed in a shared cloud environment, where we don't have access to the hypervisor directly. Because of this, whole server restores are not as easy there as they are elsewhere. Supposedly the shared cloud provider supports other appliances with a end-user facing interface, but Datto is not one of them. This is not a knock on Datto, as much as it is on the shared cloud provider. Why are you waiting? Datto is a great company to partner with, and the SIRIS (and Alto) product lines are so painless to use. Really fast restores to maintain as little down time as possible when a server goes belly up or a user deletes data. Datto does a good job of streamlining the backup validation process too - we look at a dashboard everyday, and we can see if the backups were successful or not, the last timestamp of the on device back and offsite backup, as well as the screenshot of the backed up server booting inside the appliance. "A Cloud-Based Backup Solution So Powerful, I Don't Know Where To Start"
While we've never needed to restore an entire server, there have been a few times where we needed to restore a folder or document. From how we've used it so far, I would say the thing we like best is the ability to restore data effortlessly. 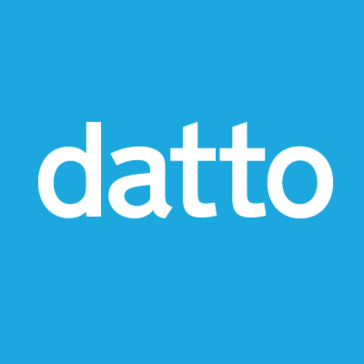 Although, the ability to spin up an entire server quickly, and how intuitive it appears to do so, may be the best features of Datto. There have been instances where we had to view a server's contents further back than the snapshots offered. I'm not sure if it's a limitation of Datto and understand that it's not practical to maintain excessive archives or backups, but this is really the only thing that I've sought from Datto that Datto couldn't do. It's really been such an awesome tool and service otherwise. Disaster recovery and business continuity, obviously. We have realized that maintaining our backups in the cloud, as well as the replications of those backups on physical servers, is vital towards the sustainability of any organization. Not to mention, it's so much easier and secure (and a million other reasons) better than the physical tapes solution we were using. "Repurpose old hardware for new use." Baremetal conversion of existing CAPEX item that no longer in use to OPEX item that can save your business or job. Datto tries to make everything shiny and simple and sometimes this means to fix simple problems you have to engage with support and they cannot really tell you anything besides, "they will fix it." Some may like this but I want to be more able to see and know what is going on with a device I am depending upon. Make sure you have the OPEX costs predicted since the local storage and recovery does not come without some cloud (DATTO only) storage and retention plan. Takes retired server and storage hardware that is not being used because of performance or architecture limitations and allows it to be repurposed where it is able to meet the performance goals. Fills a need (backup) and does not incur capital cost. "The Only Business Continuity System to buy!!! " Everything!! Datto has saved us many hours of server rebuilding due to software corruption, multiple hard drive failures at one time, user deletion !! You name it Datto has had our back when it comes to having data available to the client instantaneously!! Nothing!!! Datto has come down in their pricing and also stabilized their pricing so you don't get hit with these great sales but don't have any prospects in the pipe so your running around trying to see who you can upgrade to try to sell again if they had turned down the proposal before. Now you know what your are going to pay for the unit every time and case base your margins correctly. If you want a system you can depend upon and support when your stuck then you need Datto. Datto was able to perform a BMR (Bare Metal Restore) to dissimilar hardware, which was 7 years newer server. They took over and got all of the drivers installed and really went the extra mile to help me get my client on the new server that Dell replaced under warranty since they had maintained the extended warranty. There is margin to be profitable. We now have a business continuity system that works!! It really works! We no longer have to spend hours of unbillable time, as the server is covered under an agreement , working to mount images and perform BMR's that are time consuming from other vendors. Datto's virtualization is fast. File restore is super fast. BMR's are very automated and support is always there to help! Datto has a simple setup and easy to use portal. A more manageable backup solution from a MSP perspective. Veeam is superior but is very hard to manage centrally. "Backup & Disaster Recovery "
Quick Recovery of data and if needed bring the server up in a virtual environment. Backup is replicated offsite on secure servers. Server crashes due to hardware failure, can bring up a virtual server using this product. Building gets destroyed, bring up a virtual remotely and issue VPN clients for users. Life saver!! local virtualization, file restores and vhd exports are 3 of the best restore options available allowing a lot of options in a disaster recovery scenario. devices can freeze up sometimes. Even though there are failure alerts, manual virtualization testing is recommended to ensure functionality of the backups. Peace of mind that company data is backup up multiple times a day and that if the servers crash, local virtualization can get them up and running within 15-30 minutes. There is nothing I dislike about this product. It works flawlessly? Ease of use and comfort in a great product. Onboarding process with Datto reps can be cumbersome. If you want backup and recovery and ease of use, this is it. Complete backup and recovery for my small medium business. Having physical and virtual backup on one box. Great overall. Learning about Datto Virtual SIRIS? * We monitor all Datto Virtual SIRIS reviews to prevent fraudulent reviews and keep review quality high. We do not post reviews by company employees or direct competitors. Validated reviews require the user to submit a screenshot of the product containing their user ID, in order to verify a user is an actual user of the product. Hi there! Are you looking to implement a solution like Datto?